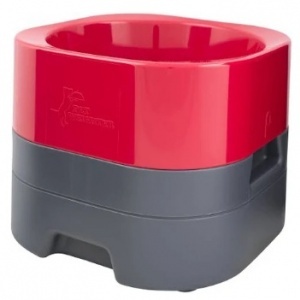 The PetWeighter raised dog bowl comprises a base and a bowl that locks onto and removes easily from the base for filling and cleaning. The base can be filled with water, sand or ice to give it a weight of up to 13kg. When the bowl is placed back on the base, pets aren't able to move the bowl around or knock it over to spill their food or water. Plus they no longer have to chase their bowl around the floor to consume their food or drink! The bowl is light and easily detachable from the base so it's easy to fill or clean. The PetWeighter is designed by healthcare engineers with hygiene in mind to ensure that the bowl has no cracks and crevices that will attract dirt. It will also stay where you put it which will help establish a dedicated feeding area in your home, and result in only one feeding zone to clean! The bowl is also dishwasher safe for convenience. I got this for my 12 week old Deerhound/Greyhound pup as he was too small for the 14” raised bowl stands the big dogs use, but was chasing his bowl across the floor each meal time. This is an excellent product, designed on the principle of the water-filled garden roller - light to transport, heavy when filled with water. The base takes 6litres of water and stays where it is put. 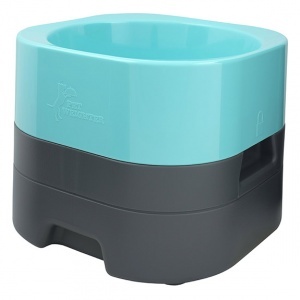 The bowl on top is big enough to fit in his medium size metal food bowl, making it very easy to clean. When the puppy grows, it will be a very useful and secure water bowl in the hallway.